Saving Downsyndrome » Aren’t We the Clever Ones? Aren’t We the Clever Ones? Callow academics defend introduction of Neo-Nazi language. Todays guest post is by Rita Joseph. Rita is a Canberra-based writer and lecturer. For more than three decades she has been researching, writing and lecturing on the philosophy of the language of human rights. A veteran human rights campaigner, she has been a frequent observer, adviser and participant at the UN. Today is ANZAC day, when New Zealand and Australia remember those lives lost in World War II. Today, Rita reminds us that we should not go down that path again. In a recent article, “Bioethics and the New Media”, two brash young bioethicists, Alberto Giubilini and Francesca Minerva, attribute the adverse public reaction to their earlier paper defending infanticide for disabled children to the “misunderstanding” between their “specialist language”, the language of “academics, including bioethicists” and “everyday language”. Their earlier paper, published in the Journal of Medical Ethics, advocated parental choice to access ‘after birth abortion’ of children with disabilities. In this new article, the authors magnanimously concede that the great unwashed public cannot fully appreciate the opportunities of new biotechnologies or the freedom and well-being that some medical options can promote. The public, they say, responds to new “ideas which go against traditional values” with an immediate impulse to rebut the proposal, “prior to any rational, cold reflection”. These psychologically programmed “yuck responses from conservatives”, the authors say, may have evolved to favor human adaptation, but it would be “a deep violation of academic freedom if bioethicists were forced not to publish the results of their research in order to avoid causing a ‘yuck’ reaction in the public”. The authors conclude optimistically that the “yuck” reaction seems to disappear after a while, “when people learn more about a certain practice or when they come to realize that it is useful”. The term ‘useful’ immediately reveals the utilitarian philosophy which underpins the particular bioethics bent of these authors. And the authors’ arrogant reliance on time and familiarity to overcome the “yuck” factor is also indicative of a kind of ideological conditioning that was very effective in medical circles committed to utilitarianism at least once before in recent history. The beginnings at first were merely a subtle shift in emphasis in the basic attitude of the physicians. It started with the acceptance of the attitude… that there is such a thing as life not worthy to be lived. This attitude in its early stages concerned itself merely with the severely and chronically sick. Gradually the sphere of those to be included in this category was enlarged to encompass the socially unproductive, the ideologically unwanted, the racially unwanted, and finally all non-Germans. Regarding “ideologically conditioned crimes against humanity”, Dr Alexander warned of the ease with which destruction of life was recommended for those considered either socially useless or socially disturbing. Eugenics is always utilitarian. It authorizes those in positions of power to pass lethal sentence on those deemed too troublesome to be allowed to live. Employing a calculus of utility, bioethicists embracing eugenics pretend to be able to predict just how much suffering will be spared to their victims, and in the long run to their families and the authorities. They do not see that each child is a unique human being—they insist that children with ‘defects’ can be easily replaced by superior children who will have greater well-being and who will not be so much trouble for their parents, families, communities, and the authorities in charge. Under a utilitarian philosophy like this, it is the ones at the most vulnerable edges of society who are made to sacrifice the most: this is the reason that French philosopher, Paul Ricoeur, condemned utilitarianism: ultimately, he says, it is always the weakest members of the human family who are sacrificed for what is claimed to be the greater good. Guiblini and Minerva rest their case on a very dubious claim that the personhood (and the right to life) of human beings depend on their possession of “particular capacities”. Before as well as after birth, those children who have disabilities are to be denied human rights protection: the children for rejection are to be branded as lacking arbitrarily selected “particular capacities”, and to be judged to be “non-persons” even though it is conceded they are human beings. Such claims are contrary to modern international human rights instruments, including the UN Convention on the Rights of Persons with Disabilities. Perhaps the greatest contribution to modern international human rights law made by the drafters of the Inter-American Convention on Human Rights is the consensus definition that “‘person’ means every human being” [Article 1(2)]. From bitter experience of slavery, they understood that human rights belong to every human being because each one is a human being. They understood that it is not in the gift of governments to confer human rights on some human beings and withdraw them from others. Neither State officials nor academics and not even these smart new toffee-nosed bioethicists have any authority to divide the human race into ‘persons’ and ‘non-persons’, while deeming the privileged group only to be ‘persons’ worthy of human rights protection. Human rights belong to “all members of the human family”. (International Bill of Rights). Human beings even in the earliest stages of life, and irrespective of age or size or disabilities, must not be subjected to discriminatory, arbitrarily defined, logically inconsistent and vexatious tests of ‘personhood’. It is for good reason that these are termed ‘human rights’ not ‘person rights’. It is not an arbitrary selection of “particular capacities” that confer human rights; it is just being a human being. The word “person,”…means something like “human being” or “individual” in everyday language, but in bioethics there is a difference between saying that someone is a human being and saying that they are a person, as persons are usually considered individuals with particular capacities. This explains why in a scientific journal the claim “dolphins are persons” sounds quite different from the same claim made, say, in a newspaper. It also explains why many bioethicists think that embryos and fetuses are not persons, but they still think that they are human beings and individuals. On the other hand, in everyday language people normally use “person,” “human being” and “individual” as synonymous. As these two bioethicists prattle on like this, I wonder if they even know or care that back in the 1930s, dehumanizing language among certain academics paved the way for medicalised killing. This is still confronting. Small Jewish children were classified “non-persons”, were renamed “Jew-dogs” and “parasites”, children who were disabled were disparaged as “life unworthy of life”, and the unborn children of Polish and Eastern workers were labelled “racially inferior offspring”. Re-definitions facilitated the killing programmes. Always the dehumanizing language came first, and then came the exterminations, the aborting of human lives ideologically reclassified as “non-persons”, and deemed totally expendable. Do these callous young authors even know where the concept they use “lives…not worth living” came from? Do these authors know that they are following in the footsteps of two once distinguished but now infamous German academics: the jurist Karl Binding of the University of Leipzig, and Alfred Hoche, Professor of Psychiatry at the University of Freiburg? Way back in 1920, Hoche and Binding argued that “…the principle of ‘allowable killing’ should be extended to the incurably sick… The right to live must be earned and justified…Theirs is not a life worth living; hence their destruction is not only tolerable but humane.” The crucial work — “The Permission to Destroy Life Unworthy of Life” (Die Freigabe der Vernichtung lebensunwerten Lebens) included as “unworthy life” not only the incurably ill but large segments of the mentally ill, the “feebleminded”, and “retarded and deformed” children. More than that, the authors professionalized and medicalized the entire concept. And they stressed the therapeutic goal of that concept: destroying life unworthy of life is “purely a healing treatment” and a “healing work.” (Robert Jay Lifton:”The Nazi doctors: medical killing and the psychology of genocide” p.46 (1986)). 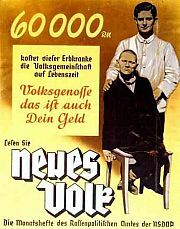 The Nazi directors of the German abortion and euthanasia programmes embraced the concept of ‘life unworthy of life’ (See the policy speech by Gerhard Wagner (head of the Nazi physicians association): “Rasse und Bevölkerungspolitik,” Der Parteitag der Ehre, vom 8, bis 14, September 1936. Offizieller Bericht über den Verlauf des Reichsparteitages mit sämtlichen Kongreßreden, Munich: Zentralverlag der NSDAP., 1936, pp.150-60). Perhaps the only excuse for the atrocities being proposed by these authors today is that they are either too egotistical to care or too ignorant to know about the Nazi precedents to what they are advocating in their recent Journal article. We should not go down that path again. So the best Rita can do is call them Nazis in a poorly written article???? If you don’t feel that the comparison is valid, or you have a response to an actual point she has made, then please feel free to make a valid contribution. Where did Rita “call them Nazis” Tony? And the best you can do is a snarky comment that trivializes evil? Language has nothing to do with the inherent dignity of a human being. You are simply using a classic eugenic and genocidal argument of trying to deny the humanity of the victim. It is an old and failed theory. Tony, Rita was pointing out that the Nazis just took Giubilini’s and Minerva’s ideas, which have been expounded before, to their logical conclusion. Nearly a century later, prenatal testing just means that human “non-persons” with certain conditions can be eliminated before birth, and Giubilini and Minerva have reaslised that prenatal testing isn’t perfect so have advocated “after-birth abortion”. No doubt euthanasia will mop up the rest. And all of course done under the auspices of “choice’. It may be cleaner and more sanitary than gas chambers but the end results are the same, so some of us will continue to find their language and the behaviour they advocate as “yucky” regardless of how prettily they try to sell it. They of course dare not openly talk about killing people because murder is still unacceptable to most of us “non-academics”. Do bioethisists consider empathy a higher level capability and part of the making of personhood? It would seem this snake might eat itself, no? Wouldn’t that be great! My son with DS has a far higher EQ than, for example, a sociopathic CEO of an oil and gas company I know of! This sociopath causes untold pain and harm as he does not have a conscience or ability to empathise, let alone love, so he is therefore less of a human being-certainly less of a human being than people with DS who, in my experience, without exception (and I know a lot of people with DS) have very high degrees of capacity to love and be empathetic. I’d prefer to detect sociopathy in order to monitor them and intercept when they cause harm. A further point is that sociopaths most certainly are extraordinarily burdensome to society. Suzy you are fantastic! Love it. I have two down syndrome children now, 24 years apart, my first and my last, and I also have a father who is a genius sociopath. No contest as to who actually makes the world a better place to live in! Powerful, disturbing reading. Thank you for sending me the link Mike.